Look out, peons! The mayor is coming through! "The politics is funny, the safety issue is not," says former 44th ward aldermanic candidate Scott Davis, summing up the latest and most brazen red light violations by Chicago Mayor Rahm Emanuel. 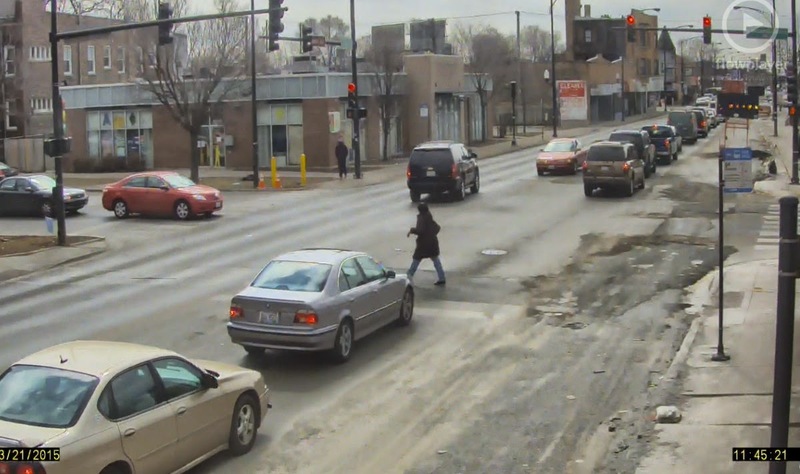 New video secured by CWB shows one of the mayor's police-driven SUVs blatantly running red lights at two busy intersections last month—even going so far as to drive the wrong way into oncoming Cicero Avenue traffic. When we reported on a rash of mayoral red light violations last winter, Emanuel blamed the second vehicle of his two-car motorcade: "When there is a tail car," Emanuel said, "there are some instances where they need to get through the light, because they can't get separated from first car, that may be what it is. But in both of these newly-secured videos, there is no tail car. There's only one car—and the violations are among the most flagrant we've seen. In the first violation, seen HERE, the car assigned to Emanuel is exiting southbound Lake Shore Drive at Belmont into an intersection brimming with bicyclists and pedestrians who were enjoying the beautiful weather on the afternoon of Saturday, March 14.
a red light into the wrong lanes of Cicero Avenue. 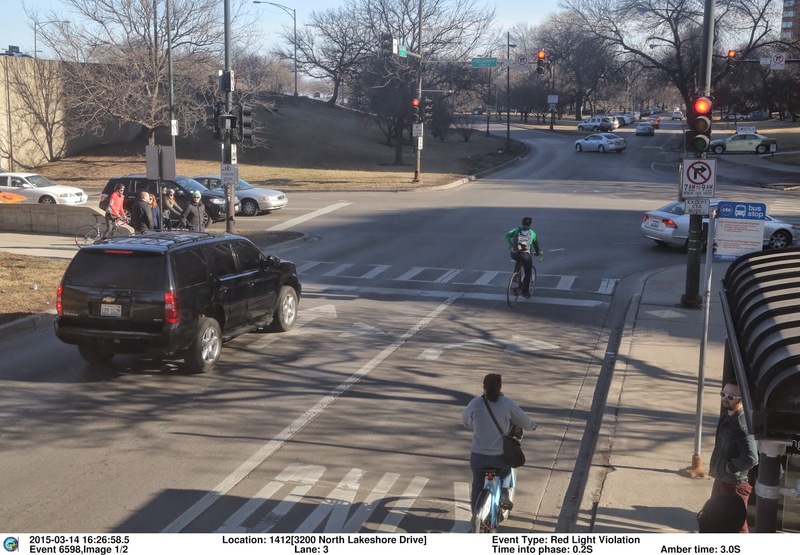 Disregarding a group of citizens waiting to cross the street and two bicyclists in the next lane, Rahm's car zips through the light to make a speedy left turn. The Belmont/LSD red light camera system is the most lucrative in the city, spitting out $813,600 worth of tickets in the second half of 2014 alone. Davis, who recently ran for 44th Ward Alderman on an anti-red light platform, says these new violations are different. "Previous reports of Mayor Emanuel's motorcade running red lights were amusing due to the irony of the Mayor's 'for the safety of our children' justifications" for photo enforcement, "this latest incident indicates a disturbing pattern of recklessness on the part of the mayor's motorcade." Exactly one week after the Belmont violation, Rahm's car was caught again—at Cicero and Washington. Check out the video. This time, his lone car has its police lights illuminated as it crosses an already-red signal and then drives the wrong way for a full block into oncoming Cicero Avenue traffic. 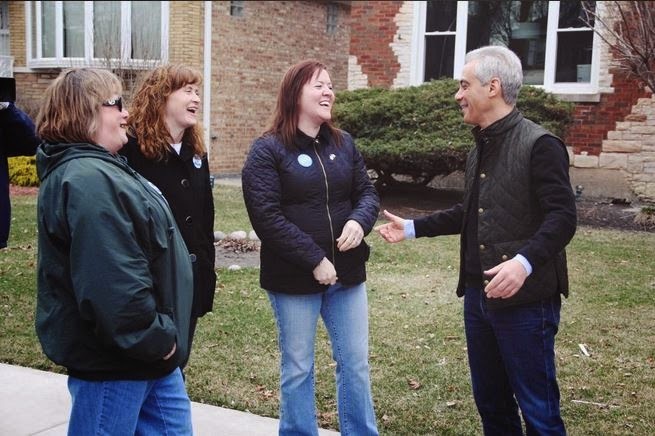 According to Emanuel's Twitter feed, the mayor was on the West Side that morning to canvass the 29th Ward for votes. "Mayor Emanuel should take action to correct this pattern of running red lights before someone is critically injured," Davis said. After the mayor's two-car motorcade was first found to be running red lights by ABC7 reporter Ben Bradley last year, Emanuel told the press his drivers had been instructed that, "No one is above the law. Obey the law. Period. Full stop." As of Sunday afternoon, neither of Emanuel's latest $100 violations had been paid. In the wake of the last batch of Emanuel violations, 44th Ward Alderman Tom Tunney suggested that the city should look at red light standards and countdown clocks at intersections. Nothing has yet become of that election season idea.